First Lady Michelle Obama and hundreds of mourners attended a funeral for 15-year-old Hadiya Pendleton Saturday morning at the Greater Harvest Baptist Church. The service began shortly after 11 a.m. to a packed room. "Hadiya was too young to leave us but not too young to make a mark," Pendleton's pastor Courtney Maxwell said at the start of the service. One of Pendleton's close friends remembers their last moment together. "Her smile lit up a room," she said. "The last thing I saw before they put her in that ambulance was her smile and I know she's smiling down on us now." Hadiya's mother Cleopatra Pendleton thanked everyone for the kind words that were spoken about her daughter. "I can stand up here and say my baby girl was good," she said. "But for all you to say she's good... that means something." Cleopatra Pendleton also thanked her family for the support she received since her daughter passed. "You don't know how hard this really is," she said. "And for those of you that do know, I'm sorry. I'm so sorry." Though the family strived to keep the focus on Pendleton the First Lady's visit has drawn attention not only to her death but to the ongoing issue of gun violence. Pendleton's godfather said he thinks her passing will help raise awareness for those who have lost their lives to violence. "She is a representative to not only the people of Chicago but to the people of this nation who have lost their lives," he said. One of her friends said he was being realistic about the situation because Pendleton "always kept it real." "This is life," he said. "This is Chicago." A letter from President Obama offering his condolences to her parents, Nathaniel and Cleopatra Pendleton, was printed on the back of the program. "We will continue to work as hard as we can to end this senseless violence," the letter read. According to the program, Illinois Secretary of State Jessie White will speak during the service. Illinois Gov. Pat Quinn, Mayor Rahm Emanuel and Rev. Jesse Jackson were also in attendance. Pendleton was killed last Tuesday at Kenwood Park on the city's South Side days after she performed at some of President Barack Obama's recent inauguration festivities. 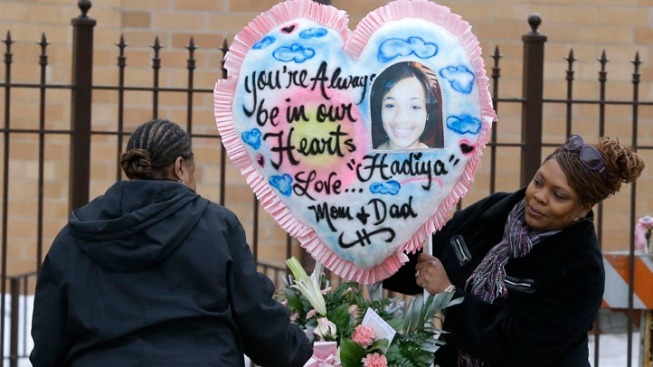 She was shot to death blocks from her school and about a mile from the president's and first lady's Chicago home. Hundreds flocked to pay their respects for the slain teen and emotions were high. The church quickly filled to maximum capacity before the service began and many people were turned away, though a large group remains gathered outside. Some of Pendleton's classmates were emotional when they couldn't get in and cried outside the church. One man was arrested after a fight broke out among the line of mourners stretching down South State Street.